One minute your sweet senior dog seems fine, taking a lovely snooze in a ray of sunshine or laying nearby chewing on a toy, and the next minute s/he is convulsing on the floor, having a seizure. After the initial fright and fear starts to ebb, and you soothe and care for your dog, your mind begins to race: Is my dog okay? What caused the seizure? Will s/he have another? Does my dog now have Canine Epilepsy? What Dogs Can Have Seizures or Get Canine Epilepsy? has had a seizure or has Canine Epilepsy can tell you, it is one of the most frightening experiences to go through with your dog. I have gone through this multiple times with two of my five dogs, both Siberian Huskies—my boy, Gibson at age three, and our girl, Harley, had her first at the golden age of 12. My journey with Gibson was a long one as he had sudden frightening grand mal and cluster seizures shortly after he turned three in 2009. After a myriad of tests, he was diagnosed with idiopathic (no known cause) Canine Epilepsy and placed on a regimen of anti-seizure medications that in combination with dietary changes, natural supplements, and holistic care, did manage his seizures and kept him seizure free for seven years! We did have scares along the way with a severe bout of ataxia, side effects from the medications, and adjustments to the doses of medications, but looking back, it is amazing that we were able to control them, and for so long. With Harley, it is a completely different story. When she had her first seizure in February of 2017 at age 12, I was momentarily in shock to see the old familiar villain coming back to visit yet another one of my dogs. And although Harley may think she is much younger, with her now in her golden years, I knew we were not dealing with Canine Epilepsy, as that typically shows itself in a dog’s early years. So a whole new set of fears and uncertainty set in. After running tests, her bloodwork showed that in just a little under a year, her thyroid levels changed (something that is not all that uncommon with seniors) and she was diagnosed with hypothyroidism, which can trigger a seizure. She went on medication and has periodic bloodtests to be sure her dosage is maintaining an appropriate level. After a year of no seizure activity, at 13, she just had her second seizure. With her thyroid levels holding fine, what could have caused this one? I don’t have to tell you the fears that shot through my mind. With a senior dog experiencing a sudden onset of seizures, the fear of a brain tumor or cancer is major concern. After reviewing her case with my vet, and knowing her history, we determined that it would be safe to wait to see what unfolds before deciding on the next step and this seizure could have been due to low blood sugar or sudden stress. While one seizure over the course of a year or two may not be a reason to sound the alarm bell, it is imperative that you have your dog go in immediately for a vet check to see if a cause can be determined. With age, the same as humans, the body undergoes various changes. As with our Harley, within just one year, her bloodtests went from perfect to her suddenly having hypothyroidism. Dogs with seizures can also have hypoglycemia – low blood sugar – something I am very familiar with as not only did Gibson have periods of low blood sugar (which can both trigger a seizure and occur post-seizure), but I, too, have been hypoglycemic for most of my life. So what to do? I give periodic low-fat treats with protein. Also, if your dog is fed once or twice a day, splitting the meals to create mini meals given two, three, or four times throughout the day can help keep hypoglycemia at bay. Always discuss any new routines, foods, or changes with your vet before implementation. on how to transport him/her to the vet or emergency hospital. Have emergency phone numbers (including a friend or family member to help) posted near your landline phone and programmed in your cell phone. Give your vet or emergency hospital a call before you leave to give them a heads-up that you are en route with a seizing dog so they can be prepared for your arrival. Journal the Seizure Activity. Keep a journal—written or digital*—of when the seizure happens, what it was like, how long it was, what your dog was doing/eating prior to the seizures, the weather, and if possible, videotape the seizure and bring it along with your dog to show your vet. *See below resources list for an excellent digital app by Royal Veterinary College (RVC). Create an Epi First Aid Kit. Already have a First Aid Kit for your dog? Update it to include items in case your dog has a seizure. See link below for my #Paws4Purple Epi First Aid Kit FREE informational bookmark available through The Anita Kaufmann Foundation for items to add to your kit. 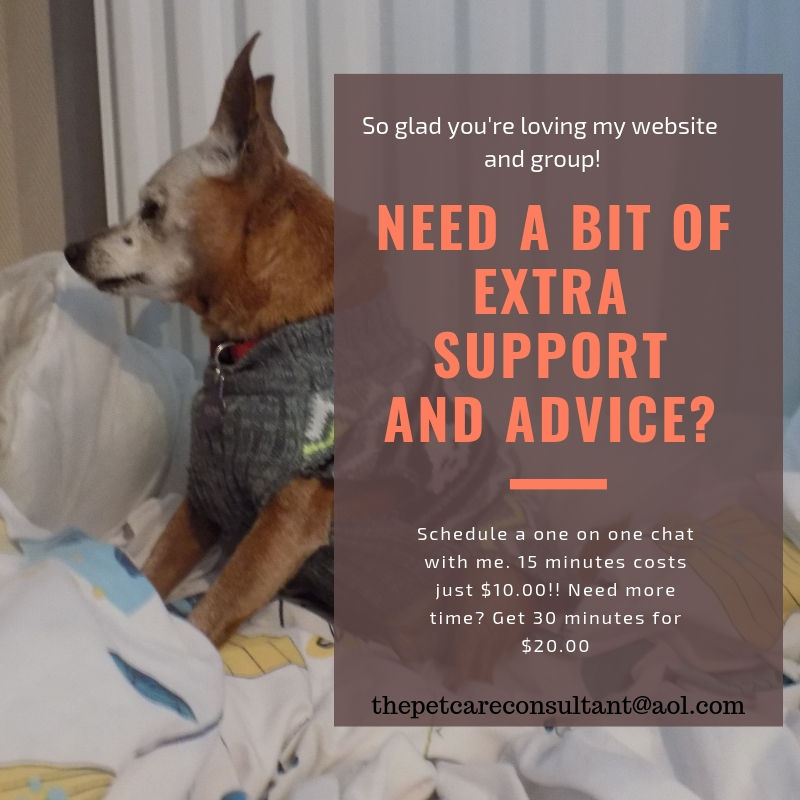 Join a Canine Epilepsy/Seizure Dogs Support Group. The information and support provided by reputable organizational groups is priceless. Living with an Epi-dog (dog with Epilepsy) or a dog who has seizures, is an hour-by-hour, day-by-day, week-by-week, month-by-month continuous watch, while hoping the seizures do not return. If your dog is diagnosed with Epilepsy and is put on anti-epileptic drugs (AEDs), the dosing schedule must be consistent. Family schedules are planned around the Epi-dog’s needs. Baby monitors and video cams with feeds connected to smart phones can be installed to keep a vigilant eye on your dog, both while at home and away. And yes, there is cost involved for vet visits, tests, medication, and possible food changes. Yet, no matter how much we do to prevent them, there is no guarantee that our dogs will not have another seizure. That is the frustrating and unsettling nature of the beast known as the “seizure monster.” But the love and amazing bond we develop with our dogs, whether it comes as a result from the extra care they require for their special needs, or just the natural human-canine bond, it is a journey well worth taking as these dogs prove over and over again that they do not let seizures stop them from living a full and happy life, the same as a dog without seizures. Check out my extensive FiveSibes #LiveGibStrong Canine Epilepsy Awareness Resource Library, including episodes of the FiveSibes “The Sibe Vibe” on Canine Epilepsy under the K-9 Epilepsy Awareness tab at www.FiveSibes.com. Join the Epil-K9 Email List for support and resource information at www.canine-epilepsy.com. 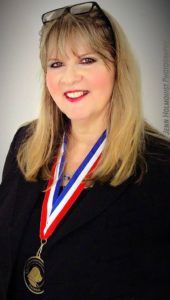 Dorothy Wills-Raftery, also known as the “FiveSibesMom,” is an award-winning author and photojournalist, Siberian Husky aficionado, and Canine Epilepsy advocate. Her canine books are EPIc Dog Tales: Heartfelt Stories About Amazing Dogs Living & Loving Life With Canine Epilepsy; the FiveSibes™ Tales children’s books What’s Wrong With Gibson? 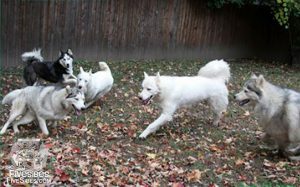 Learning About K-9 Epilepsy and Getting Healthy With Harley: Learning About Health & Fitness; and Buddy, the Christmas Husky~Based On A True Holiday Miracle (ArcticHouse Publishing). Featured in The American Dog Magazine, Dorothy is the creator, writer, and photographer of the internationally recognized FiveSibes™ blog. She is a regular contributor to American Pet Magazine, 4Knines.com blog, and Hudson Valley Paw Print Magazine. Her canine-related articles and photography has appeared in Ruff Drafts, The Sled Dogger, and Kings River Life Magazine. 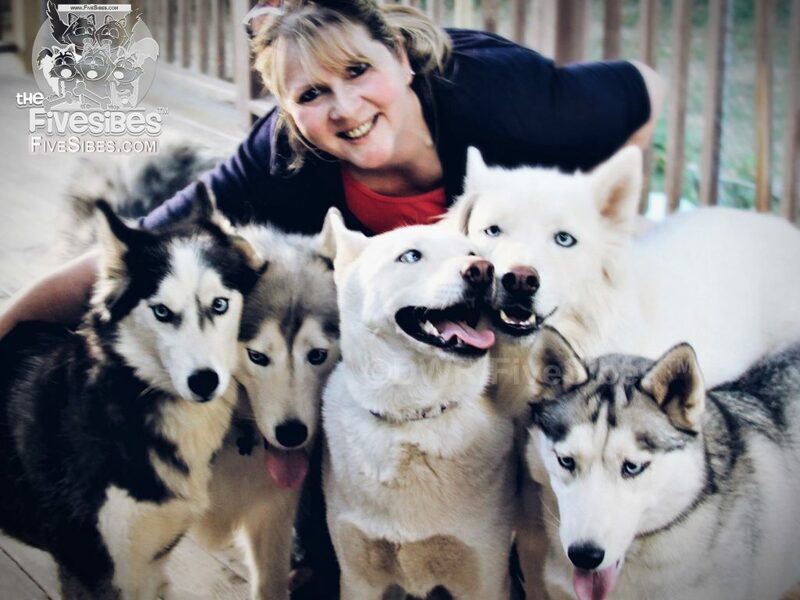 Dorothy is the writer and host of the award-nominated The Sibe Vibe show, which airs on Dog Works Radio and iTunes. Dorothy is the recipient of the 2017 NYC Big Book Award, and was named a 2017 Finalist in the “Advocate” category for the Women in the Pet Industry’s Woman of the Year Award. Dorothy is a nine-time Dog Writers of America Association (DWAA) “Excellence” nominee, and she is the two-time recipient of the DWAA’s prestigious Maxwell Medallion for work on her FiveSibes blog —once in 2017 for her FiveSibes poster for Red Nose Day to Help End Child Poverty, and in 2016 for her blog article on rescue dogs in. Named “Best Author” in 2015 & 2016 by Hudson Valley Magazine, all four of her books were named “Best in Print” by American Pet Magazine. An official International Purple Day® for Epilepsy Ambassador since 2012 and a volunteer case manager for The Wally Foundation-Canine Epilepsy, Dorothy is the creator of the FiveSibes #LiveGibStrong K-9 Epilepsy Awareness campaign inspired by her own Epi-dog, Siberian Husky, Gibson. She is the author of #Paws4Purple, a partnered Canine Epilepsy awareness and educational program with The Anita Kaufmann Foundation launched on March 26, 2018 (www.PurpleDayEveryDay.org/Paws-4-Purple). 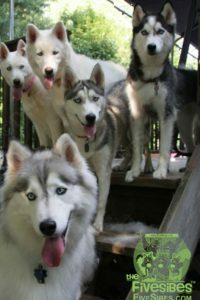 You can follow Dorothy and her FiveSibes on their website at www.FiveSibes.com, on Facebook at FiveSibes: Siberian Husky K9 News & Reviews, and Twitter (@FiveSibesMom). Epilepsy sounds scary but I guess like anything else you learn how to manage it and take the steps you need to do to be prepared, same as if you have a pet with diabetes or another chronic illness. Holly, you are so right, it is very scary every time it occurs! But, yes, being prepared truly helps. This must be so scary! Thank you for the information. My mal mix is going to be 10 this year and we are definitely starting to see signs of his aging. The first time Red had a seizure it terrified me. I was in the living room and she was sleeping on her bed which I couldn’t see from where I was. All of a sudden I heard a blood curdling scream and heard a bang. The whole thing lasted just seconds, but it was the scariest thing to witness. Naturally it happened late at night, so I called the emergency hospital and they explained what to look for and of course I saw my vet the next day. Oh, Hindy, I know that scare all too well! And how those seconds can feel so much longer as they are going through the seizure and even post-ictal stage. They supposedly do not remember the seizures (thankfully), but we sure will – for always. Hi, Shannon. You are welcome! 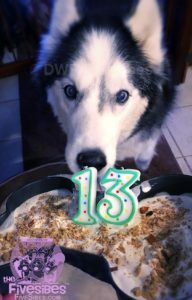 In addition to my 13-year-old Harley above, my other three Huskies turned 10 in January. While it is hard to come to terms sometimes that they are “seniors,” (but don’t tell them that! They still think they are puppies) small signs are starting to come, but I like to think of them (and me) as enjoying life at a little bit slower pace! I hope your Mal/mix will have a wonderful birthday and many more years of joy! This is kind of scary, shelties suffer of seizures, Mine has not have one but I know other sheltie dogs have them and they die soon after that. I am glad they found out is epilepsy in yours and that you have it under control. It is so scary, Adriana. Yes, shelties, like huskies, are one of the breeds prone to epilepsy. If any of your sheltie contacts need info or resources on Canine Epilepsy, I’d be happy to share with them. My boy lived with idiopathic epilepsy from 3 until his passing (not from epilepsy, but suddenly from hemangiosarcoma) until almost 10. If I can help others, I am always happy to. Hindy, thank you for having me as a guest on your wonderful website on this very important topic. The more we can share information and education about seizures in dogs of all ages, the more we can help them and their families. And the key is for anyone going through this journey to always know, they are not alone. Very informative! My friend’s 12-year-old rescued English Pointer has “vestibular events” where she will have a seizure (not grand mal) and/or become dizzy. She goes to the vet and has to get special meds for this. After a few days she will be OK. This is generally related to her age. Hi, Amy…thank you! I am glad to share the info in hopes of helping others. Seizures of any kind are so scary. I sure hope your friend’s dog is doing well. Pip had a seizure during his final week with us. I will never forget it as it had never happened to him before and was quite upsetting. We didn’t even have a chance to investigate what had caused it as his final week he had so many issues going on. We immediately brought him to the vet, but when he arrived his breathing (from his heart failure) had worsened so they focused on that. I assume the seizure was all related to his failing heart. Oh, sweet Pip. How heart-wrenching that must have been…they are very frightening to watch, and to see it in an elderly dog is very scary as we know it is not epilepsy, but related to something else going on. I sure do miss seeing Pip’s sweet face in your blog. I am so sorry for your loss, and that it was in such an upsetting manner. Sending you a big hug. The rule of thumb is that when either young pups or senior dogs start with seizures, epilepsy is not likely at all. Which may be a good news or a bad news. I hope it’s going to be something that can be addressed for Harley. Exactly right, Jana. Epilepsy typically shows up in young dogs ..my Gibson had his first seizure at age 3. Our Harley, on the other hand, as I stated in the article, began seizures as a senior and it is typically never epilepsy at that age, which like you said is good or bad…good it is not epilepsy, but then you have to worry why… never any easy answers. Thank you for your kind words about Harley! Right now, (fingers, toes, and paws all crossed) we are looking at hypothyroidism for the first seizure, and hypoglycemia for the last one. All manageable, if that is the cause (at this point and age, I sure hope that is it). I can relate to this post. I lived with an American Eskimo that had a seizure at the age of 6 which prompted a vet visit. Fortunately, this vet was aware of the link between seizures and hypothyroidism and we were able to put her on a compounded medication that kept her seizure free for the next 7 years. At the age of 13, the seizures reappeared. This time, brain cancer was causing the seizures. I had to let my baby go to free her from her pain. Amelia, yes, both my Epi-dog Gibson was on medication for hypothyroidism, as is my senior girl Harley now, and she is also on medication. I am so glad to hear that the medication helped your girl for 7 years! Cancer is such a beast – that is how I lost my Gibson also. My heart goes out to you for the loss of your girl. We had a dog with Canine Epilepsy named Maui. After getting her seizures under control with medication, she would go on to live 5 years, and go almost 3 without a single seizure. Thank you for sharing this very important information. You are very welcome, Rachel. I am happy to hear that Maul’s seizures were managed by medication. That is a huge feat! My Gibson, too, was managed with medication, although he did have side effects, he was able to be seizure free the last several years of his life. I know I’ve shared with you about my having 2 seizures 40 years ago. There was no medical reason for them occurring (after numerous tests). I was on medication for 10 years until the doctor decided to take me off and I’ve never had another one. They believe mine was related to stress. It was a scary experience so I can just imagine watching one of my fur children having a seizure. It must have been so frightening for you and your family! I am so glad that you had no more seizures after the doctor took you off the medication. Stress is such a key factor in triggering seizures in both humans and canines, and that is not always an easy thing to control! I hope you always remain seizure free and wish you the best of health always!